Did you ever dream BIG? So big in fact that you were afraid to tell the world about it? And even though you knew you wanted to get “there” and you believed it was possible, you had no idea how exactly that would all come together? “Dream BIG” is probably one of the most amazing advice one could give or get. Without it, we’re just living day by day without thinking about what it is WE want. Life gets reactive instead of intentional. Which is why I hope you dream, and dream BIG, on the regular. It’s an active part of creating a happy life full of abundance and beauty around you. Yet we devalue this activity, associating it with poets and labelling as “unpractical”. I, on the other hand, think that day-dreaming should actually be taught at school. Because if all I learn are tools to solve problems (be it maths, chemistry, history), but I never learn to think about what I could do with them, I’m going to end up solving other people’s problems (again, be it maths, chemistry, history) for whoever asks me to solve one. Those who actually do the asking had to do some day-dreaming in the first place. That’s how you get to work on your projects, on your agenda, solving problems that you wanted to solve. And the more you day-dream, the better your ideas will get. You’ll actually learn how to dream BIG. So if you haven’t done that in a while, set a timer for 10minutes (that’s all I ever do at a time, 10minutes is plenty), close your eyes and imagine. Imagine your dreams becoming true. Imagine how you got there. Imagine yourself having “that” already and enjoying every second of it. I love BIG dreams. They’re the best kind. A challenge. A quest outside of comfort zone. You get to learn new things about yourself every day. Human beings are rather contradicting creatures in that sense. We can hold two totally opposing beliefs all at the same time. But there might be another part of you, which at the same time believes something bad will happen once you achieve your dream. In the scenario of your Dream Home, it might be that a part of you is worried how you’d manage paying the bigger bills or mortgage. In other scenarios, that part of you might think that when you achieve this BIG dream of yours, you won’t actually cope with the consequences, maybe you fear people will envy you and they’ll talk about you behind your back, or maybe you’re scared about your relationship. Whatever bad thing you think might happen when you achieve your BIG goal, you need to look at all of those thoughts and fears carefully. Left unattended, those little monsters will keep you from going for that BIG dream. Awareness is half the job. Those irrational fears that you won’t cope with the new “problems” that arise when you achieve what you wanted don’t take into consideration that you’ve been coping with all sorts of obstacles throughout your life. And you’ve always learnt how to deal with whatever came your way. So why should that stop you from going for what you want? Naming the monsters in our head will frees us from their claws. So do, by all means, dream BIG and day-dream every day. 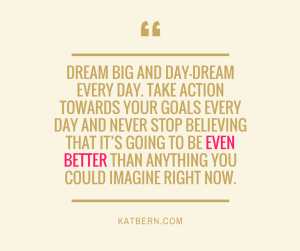 Do take action towards your goals every day and never stop believing that it’s going to be even better than anything you could imagine right now. But while you do all of that, don’t forget to look under the hood of all of those wonderful things and NAME what bad things you believe might happen once you get “there”. I bet that once you put them into words you’ll be able to come up with at least a few reasons for each for why that is not true. But if you never look at the perceived negative consequences, that part of you that believes they are true will do everything it can to make sure you never find out what it’s like, good or bad. And now over to you. I would love to hear from you in the comments below: what one bad thing do you believe might happen when you achieve your BIG dream? And what are the 2-3 reasons why that thought is in fact incorrect? I’ll start: If I reach my big goal for this year, that might trigger some people close to me and they might be jealous. Why is that thought BS? Because if my friends would have a problem with me being happy rather than be happy for me, then how good friends were they in the first place? Also, the past experiences suggest that my friends ARE in fact happy for me when I reach my goals, so there is no reason to think it would be any different now. Now it’s your turn. Leave a comment below. And if you enjoyed this article, share it with your friends on social media. Together we can make sure you actually do achieve your BIG dreams this year. P.S. If you’d like more tools on how to dream up and achieve those BIG goals and be happier in your life, check out my FREE video series on The Crucial Shifts You Need To Make (And How) To Stop Playing Small And Start Living The Happy, SATISFIED Life You Want. I can’t wait to see you there! K.
I’m most scared I’ll be too busy to watch TV, or go out with my family on a whim, or that I’ll just be stressed from working too much. I know that doesn’t have to be the case though. Also, loved this article! It definitely doesn’t have to be like that, Cole! And realising this means you’re half way there to putting those thoughts to bed. Well done. I’ve always not wanted to share my dreams with other people until they actually happen because I’m afraid I will fail and then they will know I failed. But it is possible to fear success as well, because if I actually get what I want I may screw it up once I get there. Sara, there is something here to keep in mind about your first point though: if you share your dreams with other people – they might be able to help you get where you want to go. It is not easy to accept that you’re afraid you might fail and feel bad about other people witnessing this event, but on the other side having a group of trusted friends support you in reaching your goals might have a much bigger impact on you being able to achieve your goals. It’s worth to take the big leap. All the best! I, for one, hope you can make them come true. more you talk about it the more people you will attact to yourself who will support your big dreams. And you can have better faith in your friends, you need them to cheer you on, they are not waiting for your downfall. I think dreams are often chaning as we grow and our priorities change. 20 years ago i didn’t want to reach big because my priority was raising a family. Along the way i have gained many skills which now serve my new dream of making it big in fame and wealth. Friends reactions change as well, the same friends you may have had raising a family may not relate to your new dream.It’s ok to make new friends who support this new view, this new dream. I think I had more fears based on the financial responsability of accounting and taxes. it’s not such a big deal when you aren’t making money. But my realization was when I am making a lot of money I can pay other people to take care of it for me! Thanks Kat, this was a great blog. Thank you, Laurel, I’m glad you enjoyed it.